Taste test: I like the taste of Frosted Flakes, with or without milk. But I didn't like the taste of this bar at all. It tasted weird. 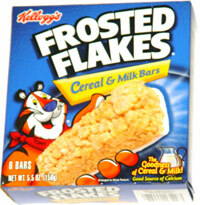 I really didn't taste anything like Frosted Flakes, nor like milk. Like most of the cereal and milk bars, this was somebody's terrible idea, worse than most other similar bars in this case. Smell test: Not a lot, but slightly sugary.